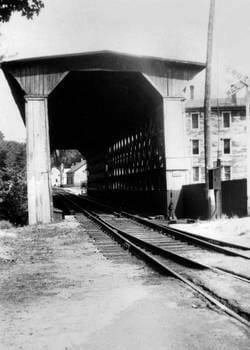 Built in 1889 to replace a lighter covered railroad bridge constructed between 1849–50, having been built by the former Concord and Claremont Railroad (acquired by the Boston & Maine Railroad in 1887), the bridge is the oldest of four surviving double-web Town lattice railroad bridges, and is the oldest extant covered railroad bridge in the United States. (The others double Towns are Pier Bridge, Newport, New Hampshire, 1907; Wright's Bridge, Newport, NH, 1906; and Fisher Bridge, Stowe, Vermont, 1908.) It was probably designed by Boston & Maine Railroad engineer Jonathan Parker Snow (1848–1933) and built by carpenter David Hazelton (1832–1908). 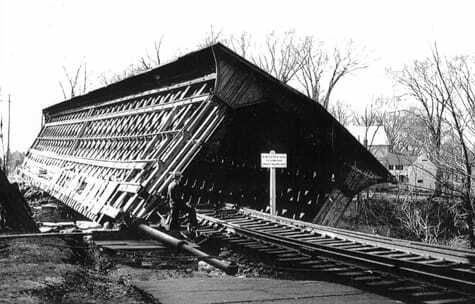 Under Snow, the Boston & Maine utilized wooden bridges on its branch lines longer than any other major railroad, the last of these constructed in 1916. The bridge presents the clearest, most original structure of its type, as the others incorporate significant structural modifications. The main trusses are double Town lattice and are continuous over a central pier to form two spans of approximately 71 feet (22 m) each. It has been often said they were built by the mile and cut off by the yard. The center pier is skewed to match the river flow, as are the abutments. This is because the bridge spans the river on a bias. The bridge was in use as a railroad bridge until 1962, survived a flood in 1936, a hurricane in 1938, and was moved off its foundations twice during its lifespan and saved from being completely washed down river by the rail tracks running through it. 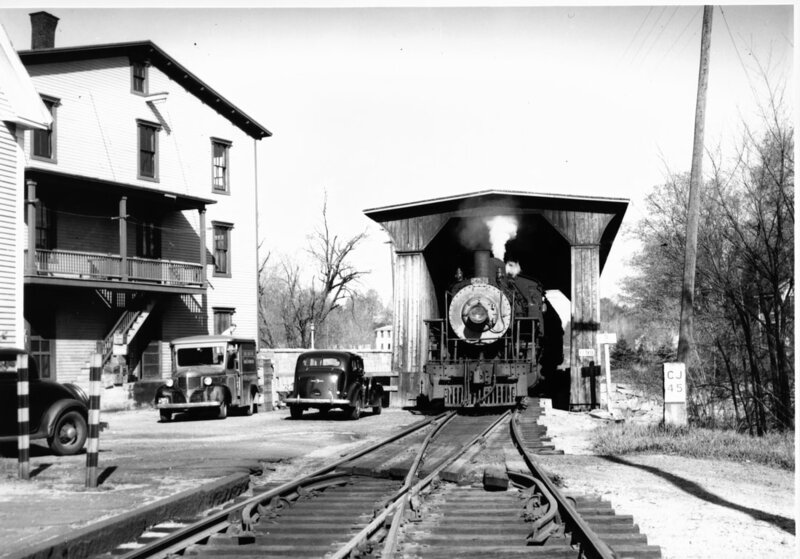 Following its railroad service, it functioned as a warehouse between 1962 and 1990. 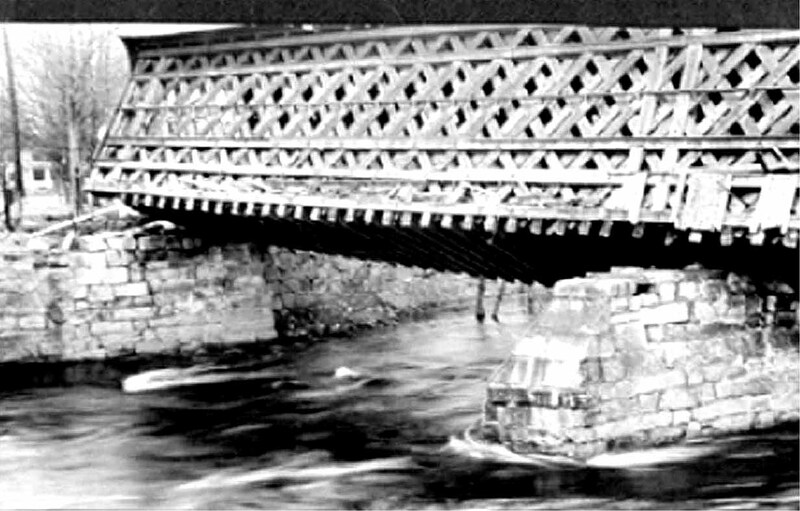 In 2006 the bridge saw minor structural repairs to its bottom chord at the upstream north corner, the bolsters were replaced for the first time since the hurricane of 1938, and the bed timbers were replaced by granite pedestals. 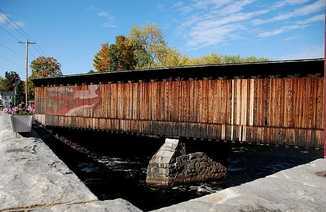 The work was paid for by a donation from the National Society for the Preservation of Covered Bridges. Recently the bridge underwent slight alterations being completed mid-winter 2009-2010 which consisted of a dry-head, open pipe sprinkler system for the bridge interior with exterior fire department connection, including linear heat detectors, fire alarm system, fire retardant coating and LED motion sensor lighting inside the bridge at an approximate cost of $123,300 paid for and engineered by the New Hampshire Department of Transportation.